If you can’t afford a genuine Ford Mustang Boss 302 then you might want to consider going smaller – 1/16 to be exact. In late 2010 Traxxas announced that they would be producing an officially-licensed RC replica of the Boss 302 featuring full time AWD, a fully adjustable suspension and a Velineon 380 or Titan 550 motor (we don’t know what that means exactly, but we’re sure you RC guys do). The car doesn’t necessarily have the same detail or proportions as a standard scale model replica, but that’ s not necessarily the point. The RC version is all about fun, with a 50+ mph top end and the ability to do high speed power slides. To give a better idea of what it’s like to pilot the 1/16 Mustang Boss 302, Traxxas has released a new video of the car in action. In addition to showing off the details of the car, the footage includes plenty of tire spinning and sideways driving. You can check out the video for yourself below. 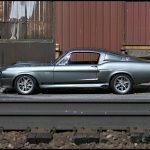 This entry was written by by MustangsDaily (Mustangs Daily) and posted here on Friday, June 15th, 2012 at 11:35 am and is filed under boss 302, ford mustang boss 302, mustang boss 302, traxxas, traxxas 1/16 mustang boss 302, traxxas boss 302, traxxas ford mustang boss 302, Videos. This article was not written by us, rather gathered using RSS feeds listed here. We take no credit for this article. You can leave a response, or trackback from your own site.